Akitas and Macrothrombocytopenia - We dare you! Laboratory findings of this condition are a low platelet count with platelets that may be larger than normal. Dogs with inherited macrothrombocytopenia do not suffer from clinical bleeding and there can be a negative or no response to treatments. These dogs with low platelet count can be confused with dogs who have thrombocytopenia with bleeding disorders. The three Akitas had symptoms of macrothrombocytopenia. In some breeds like Cavalier King Charles Spaniel this is caused by a mutation in the beta-1 tubulin gene and it is an autosomal recessive trait. These three Akitas were negative for this gene mutation, so it seems some other gene mutation is responsible for this condition in Akitas and the inheritance method is still unknown. There have been previous cases of Akitas with low platelet count without any health issues. They only seem to get sick when they are treated for the low platelet count. Treatment can be very dangerous to these Akitas and it might even be fatal. Until we get more information about this issue, it is recommended that breeders and vets are careful when treating Akitas with low platelet count. There is ongoing research about this issue by Dr P.W. Christopherson at Auburn University. At the moment Akitas with these laboratory findings in USA can participate by sending Dr Christopherson one tube EDTA (purple top) blood and some well-made blood smear slides. No ice packs are needed; it just needs to be packed so that the tube and the slides don’t break. Dr Christopherson is currently researching what forms might be needed to send samples by mail from other countries so they clear customs. We will post updates soon as we know more. Hayakawa, S., Spangler, E. A., Christopherson, P. W., & Boudreaux, M. K. (2016). A novel form of macrothrombocytopenia in Akita dogs. Veterinary Clinical Pathology. Caldin, M., Zoia, A., Tasca, S., & Furlanello, T. (2016). Thrombocytopenia in Japanese Akita dogs. Veterinary Clinical Pathology, 45(3), 397-397. Drachman, J. G. (2004). Inherited thrombocytopenia: when a low platelet count does not mean ITP. Blood, 103(2), 390-398. 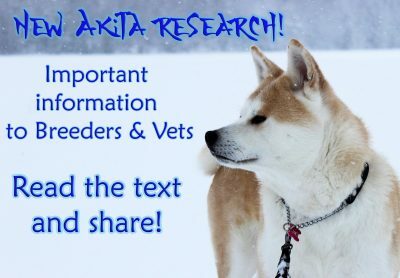 The publishing of this article as well as the picture on the Akita Unleashed web-site is approved by the FB-group – Akita Health & Genetic. ← Akaya’s diary is now up to date!